We know many people are awful. We've seen the evidence! But still, no matter how thoroughly I try to storm-proof my emotional windows (my eyes and ears), droplets of hate somehow manage to trickle through, causing a flood in my basement (my heart n' soul). A growing number of protesters (including high-profile athletes) have adopted the phrase, "I can't breathe," as something like a rallying cry. The statement references Eric Garner's last words as he was killed by NYPD Officer Daniel Pantaleo in an illegal chokehold. A coroner determined the death a homicide, but a grand jury still decided not to indict Pantaleo. A real failure of the justice system, right? 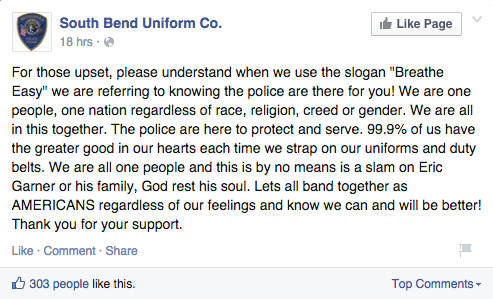 Apparently not everyone agrees, and some, specifically the South Bend Uniform Company, even find the phrase's appropriation offensive. 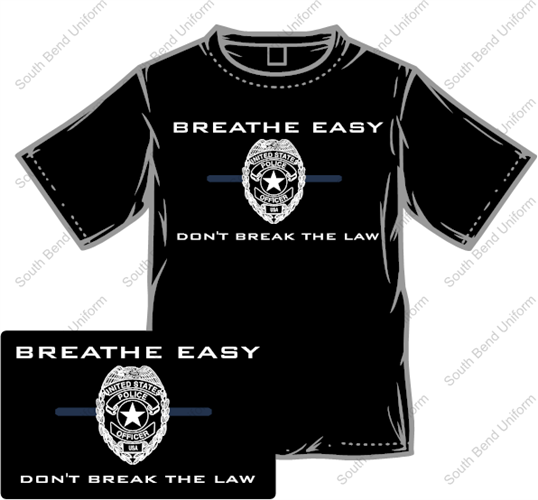 The company, owned by Corporal Jason Barthel, a cop with the City of Mishawaka Police, has started producing shirts reading "Breathe easy: Don't break the law," a response that is particularly biting given the fact that 1) Eric Garner was not breaking the law, and 2) He is dead. But the company assures the public via its Facebook page that the shirt is not a dig at Eric Garner-- just a friendly way of reminding us that the police are here to help! Barthel explained, "We are not here to do anything negative to the public. We're here to protect the public and we want you to breathe easy knowing that the police are here to be with you and for you and protect you." Can he really think that's a convincing explanation?